Just about everything Mel Gibson does in Edge of Darkness is illegal in Massachusetts. Older, craggier, and sadder, Mel plays a Boston police detective whose daughter, apple of his eye though they haven't seen eye to eye in years, is shotgunned down at his doorstep. Mel swears revenge, and gets it. Sounds like a simple story, like Taken, but unlike Liam Neeson's relatively straightforward "murder half of the Paris underworld to find my kidnapped daughter" actioner, Edge of Darkness plunges Mel into a labyrinthine investigation involving a shadowy corporation called Northmoor, which may or may not be supplying nuclear weapons to enemy nations (it does) with US Government complicity (it is), and who may or may not have been responsible for the execution of Mel's daughter and her tree-hugging hippie "terrorist" chums (they are). Edge of Darkness doesn't play like a taut, wind-up toy; Mel's bereaved cop pursues his investigation at a somber pace, driving around Boston and Western Massachusetts trying to track down his daughter's friends and associates while staving off a psychotic breakdown. To the filmmakers' credit, Mel's movements around the Boston area mostly make logistical sense, though the location of Northmoor headquarters seems to shift from Western Mass. to the North Shore halfway through the movie. The languid pace of Mel's detective work is rocked at regular intervals by stunningly shift, knock-you-out-of-your-chair, brutal bursts of bloody violence. 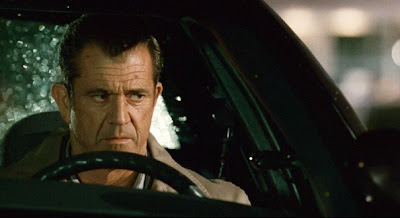 My favorite ultraviolent moment was Mel staring down a car about to run him over and emptying his beretta until the driver is dead and the car careens into a river. When Mel pays a visit to Danny Huston, the "insane" head of Northmoor, to find out more about what his daughter did for a living, he finds Northmoor headquarters to be a vast, multi-acre complex "leased from the US Government" that even a James Bond villain would think is much too sprawling. At this point, it becomes clear that whatever Northmoor and the US Government agents, including Ray Winstone, who liaison with Huston are up to, it's too big for Mel's weary Boston cop to take on. I did enjoy how the G-Men scolded Huston for his methods of disposing of his enemies (radioactive gas and poison milk) and the headaches he creates by acting like a diabolical comic book super villain. The filmmakers also seemed to understand that the plot was too much for a lone cop wanting someone to pay for his daughter's murder to handle. (Maybe if Danny Glover were there too, but he's nowhere to be found, sadly. No way Murtaugh would sell his partner out like Mel's friend does here.) Fortunately, Edge of Darkness follows the classic Mel Gibson action playbook of how to handle bad guys: "No way you live." When Mel's done with the heavies, Winstone even picks up Mel's slack and keeps the violence coming, blowing away all of the movie's loose ends. that helps and urges you to tumblr.com/ view and download charmingly Refer elegant TV shows in HD top quality Terrarium TV Download and Install on PC, APK Android Free that as well without spending a single dollar. Just Terrarium Terrarium TV TELEVISION in your PC is all you need to commemorate Terrarium TV APK your love for TV programs. This has come to be a bridge to attach people all over the world. Mobdro Mobdro allows watching motion pictures, TV channels, music, show, Click Here information, sporting activities, tech as well as Mobdro APK more video clips on tablets as well as mobile phones.